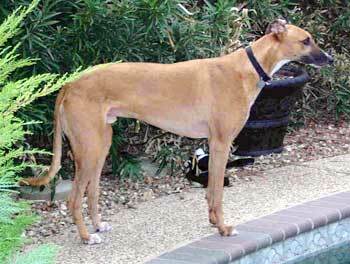 Dozer, aka Ed's Caterpillar, is a striking 6-year-old red fawn male, born September 6, 2001. His sire is Fortified Power, making his grand-sire the famous Fortress, and his dam is Minaki Rebel. Dozer's racing career started November 2, 2003 at Wichita and finished September 4, 2004. 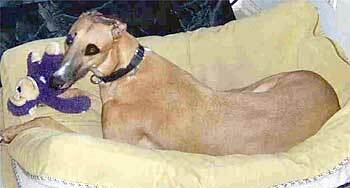 He was then a blood donor until he accidentally broke his back leg during playtime in October 2005. Dozer's leg has healed and we are happy to report that he has gotten the "good to go" from Dr. Bob Radasch of the Dallas Veterinary Surgical Center. Dozer was lovingly cared for by his foster family throughout his recovery, and then went on to be adopted for a little over a year, but it was not to be his forver home. He's ready to start his forever home search once again. Dozer is doing great. He leg has very little scarring and he walks well on all four legs. 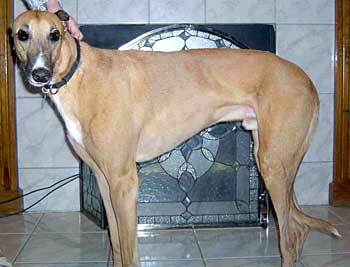 He is a smiling greyhound who is loving, affectionate, very quiet and smart. His running is slow as he is careful with his newly rebuilt leg (smart boy!) He loves to go on short walks and nap on a soft bed. He would do great as the center of attention in a home where people work and he gets lots of quiet time to rest. He only needs to go out 3 times a day and is so happy to live in a family atmosphere. He is fine with our toy dog and definitely NOT a picky eater. He is crate trained, comes when called, never chews anything but toys, never gets cranky and loves to be petted and massaged. He gets along with our other greyhounds and enjoys meeting new people and dogs.